Jetwing Lagoon, Sri Lanka: A stylish Sri Lankan spa resort set in a wild and natural spot between the Indian Ocean and the lagoon at Negombo, which is known for its distinct elegance and peaceful solitude. The 55-room hotel is historically significant for being the first resort designed by legendary Sri Lankan architect Geoffrey Bawa. The magnificent swimming pool, the longest on Sri Lanka’s north-west coast, runs from the hotel’s reception through to the main property, and along with jungle foliage and cool breeze, helps to create an atmosphere of pure relaxation. 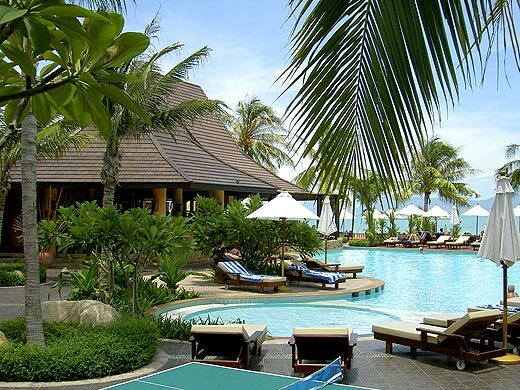 Bo Phut Resort and Spa, Koh Samui: Bo Phut is one of the most peaceful and luxurious hideaways on the tropical Thai island of Koh Samui, set in pretty landscaped gardens and surrounded by sapphire waters. The 61 rooms, including 32 villas – some with outdoor Jacuzzis and private pools – are designed in modern Thai style and use natural materials that blend perfectly with the garden setting. The resort has two restaurants featuring different cuisines. L’Ocean is an all-day beachfront restaurant that serves a delectable selection of local and international cuisine. At Sala Thai, the resort’s signature restaurant, guests can savour authentic Thai cuisine whilst enjoying the sounds of the ‘khim’ – a traditional Thai musical instrument. WH Ming Hotel, Shanghai: Five-star WH Ming Hotel is the latest addition to SLH’s growing portfolio in China and is situated in a relatively tranquil area of bustling Shanghai. Overlooking the green of Huangxing Park, all 166 rooms and suites have spectacular park and river views and are designed in a modern Art Deco style with traditional Oriental touches. The hotel also features four distinctly different restaurants featuring Asian, Western and Chinese cuisine, including upscale fine dining Shanghainese restaurant Shanghai Min. Cocktail bar Ming Club, on the top floor of the hotel, offers a great selection of cigars, wine and cocktails and live Jazz performances. Hotel Eclat, Beijing: This is Beijing’s newest hotel and opened in February to much anticipation. The hotel is already cited as one of the city’s most elegant hotels since it is housed in an architecturally-striking gleaming glass pyramid, which is part of a new fashionable development with designer boutiques and high-end restaurants. The 100 rooms are inordinately generous, many with a private terrace and some with their own pool. The hotel is also culturally significant with a stunning contemporary art collection, which includes original sculptures and paintings by Salvador Dali, Andy Warhol and Zeng Fangzhi amongst others. Khyber Himalayan Resort and Spa, Kasmir: SLH’s first hotel in Kashmir opened in December last year and is the first luxury resort to open in the skiing destination of Gulmarg in the Pir Panjal range of the Himalayas. All rooms offer breathtaking views of either the Affarwat Peaks or surrounding evergreen valleys. Their interiors are designed with traditional materials and draw upon Kashmir’s rich heritage of craftsmanship, combining Namda felted wool, locally sourced silk carpets, furnishings embellished with crewel embroidery and carved walnut panelling.